Vio and VioBright Dyes represent a family of fluorochromes for flow cytometry and fluorescence microscopy. They are characterized by high fluorescence intensities and low spillover, making them an ideal choice for multicolor applications. Emission spectra of VioBlue, VioBright 515, Vio 515, VioGreen, VioBright FITC, PE-Vio 615, PerCP-Vio 700, PE-Vio 770, and APC-Vio 770. Designed to maximize the potential of a flow cytometer’s violet laser, the VioBlue® Dye shows superior performance compared to many other fluorophores excited at 405 nm, including significant advances in brightness, signal-to-noise ratios, and intralaser compensation requirements. In addition, VioBlue exhibits minimal photo-induced degradation, and can consequently be used for many different applications, such as fluorescence microscopy. For detailed information including stability, spillover, and brightness data, please visit the MACS Handbook. Designed to maximize the potential of a flow cytometer’s violet laser, the VioGreen™ Dye shows superior performance compared with many other fluorophores excited at 405 nm, including significant advances in brightness, signal-to-noise ratios, and intralaser compensation requirements. In addition, VioGreen exhibits minimal levels of photo-induced degradation, and can consequently be used for many different applications, such as fluorescence microscopy. VioBright 515 and Vio 515 are extremely bright dyes for the B1/FITC-channel. The proprietary VioBright multimerization technology results in a 4-fold increase in brightness over the traditional FITC dye. With a 25% reduced spill-over into the B2/PE-channel and high photo stability, these dyes are excellent choices for immunofluorescence microscopy applications. VioBright FITC is a blue laser (488 nm) excited revolutionary dye, which allows an increased number of FITC molecules per antibody, as compared to conventional FITC conjugation. With brightness similar to PE, VioBright FITC expands the dimensions of multicolor flow analysis. In addition, it provides a bright alternative for confident detection of rare cells, as well as dim and uncharacterized markers. Absorption and emission peaks of fluorochromes compared to VioBright 515, Vio 515, and VioBright FITC. The PerCP-Vio 700 Dye is a tandem conjugate that combines the peridinin chlorophyll protein (PerCP) and the new Vio 700 Dye to emit a strong fluorescence at 655–730 nm upon blue laser excitation at 488 nm. This dye is suited perfectly for the B3 channel of the MACSQuant® Analyzer. Absorption and emission maximums of fluorochromes comparable to PerCP-Vio 700. The PE-Vio 770 Dye is a tandem conjugate, like PE-Cy™7, that exploits the principle of fluorescence-resonance-energy-transfer (FRET) allowing for large Stokes shifts between the absorbed energy of a fluorescence donor (PE) and the emission wavelength of a suitable acceptor (Vio 770) dye. Excitation with the blue (488 nm) or yellow (561 nm) laser, emission in the near-infrared region at 775 nm. The combination of Vio 770 as the acceptor dye and an optimized chemistry have furnished a tandem dye that is characterized by a high fluorescence intensity, minimal spillover to adjacent detection channels, and low non-specific binding to non-target cells to meet the complexity of multiparameter flow cytometry. Absorption and emission maximums of fluorochromes comparable to PE-Vio 770. PE-Vio 615 is a tandem dye with PE as the donor dye and Vio 615 as the acceptor dye. This tandem dye is optimized for efficient donor-to-acceptor dye energy transfer, high fluorescent intensity, and low spillover into the donor dye detection channel. Designed to be a superior alternative to ECD, PE-Texas Red®, PE-efluor® 610, PE-CF594 and PE/Dazzle™ 594, this Vio Dye expands the options for flexible multicolor panel design and provides a bright dye for confident detection of dim and rare markers. Optimal excitation with blue (488 nm), green (532 nm), and yellow green (561 nm) laser lines for maximum flexibility. Excellent brightness for confident detection of dim, rare, and uncharacterized markers. Extensive portfolio of PE-Vio 615 dye conjugated to recombinantly engineered REAfinity™ Antibodies for higher reproducibility. Absorption and emission maximums of fluorochromes comparable to PE-Vio 615. The APC-Vio 770 Dye is a tandem conjugate, like APC-Cy™7 or APC-H7, that exploits the principle of fluorescence-resonance-energy transfer (FRET) allowing for large Stokes shifts between the absorbed energy of a fluorescence donor (APC) and the emission wavelength of a suitable acceptor (Vio 770) dye. Excitation with the yellow (561 nm) or red (635 nm) laser, emission in the near-infrared region at 775 nm. Higher MFI and stain index values, in addition to lower compensation settings when compared to APC-Cy7. VioBright 667 and Vio 667 are extremely bright dyes for the R1/APC-channel. The proprietary VioBright multimerization technology results in a 2-fold increase in brightness over the traditional APC dye. Absorption and emission maxima of fluorochromes related to APC. 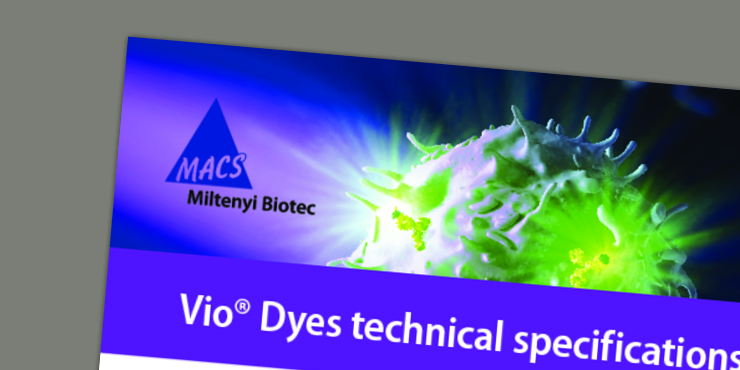 Download our brochure to find out more about Vio and VioBright Dyes.